I wanted to be a background artiste from childhood, I just didn’t know where to begin. Eventually, aged 20, I joined a couple of agencies, sent in photos etc, vital stats, and waited in hope. As luck would have it, I was accepted on to their “books” followed by a call soon after to ask if I would be free to appear in Midsomer Murders. Being a big fan of the series, I jumped at the chance to fulfil once of my childhood ambitions. I was lucky enough to appear in 2 episodes – “Ring out your dead” in 2001, and “The Fisher King” in 2003. Lots of people want to have a go so I thought I would share my experiences as I had such an enjoyable time and met some great people. 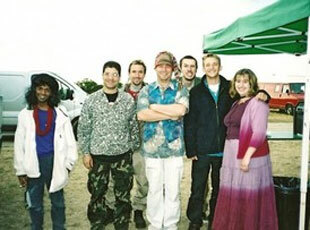 “Ring out your Dead” was being filmed in North Stoke village, during one of the hottest days of June 2001. I had to be on set by 7.30am, which wasn’t really a problem as I lived 20 minutes drive away. 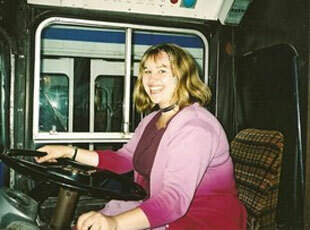 (Luckily being a local girl, the travelling was never far from where I live). I remember entering the village and seeing a lot of trailers and vehicles, not to mention people milling around. Once I had reported in to someone, and parked my car, I just had to sit back and wait until I was called for a shoot. There were plenty of people around to chat to and some welcome refreshments provided. For my first shoot I had to walk down the road with a couple of other people, eating an ice cream as I went. On a hot day this was the perfect treat and in fact I had two ice-creams; the first one melted too quickly so the director gave me another! Then, in my role as a villager, I was then asked to be in a couple of inside shots in the local village hall where an event was going on. The filming finished about 6.30pm and eventually all the “extras” were told we could go home (once we had filled in various forms etc for payment). There is a lot of hanging about but I knew this, so came prepared with a good book. As it was I didn’t read any of it as I was too busy talking to everyone else who was there. I had a really good day out in the sunshine in North Stoke, and left with a lot of happy memories, and wishing I could do it all again. Sally Price on location with the background artistes in The Fisher King epsiode of Midsomer Murders“The Fisher King” was being filmed in Great Haseley village, which again was local to home. This time I ended up doing 3 days filming for the episode. The first was another hot summer day in July 2003. My character this time was a hippy/festival goer, so suitably dressed, I drove to the location, and parked up in a field in Great Haseley. There were already lots of people there, and we got on a minibus that took us further down the road through the village and into a field that had been transformed into a real hippy camp. A polystyrene stone circle was the main feature, although some stalls had also been set up. We were instructed to walk around the fair as if attending a normal every day craft fair. Again there was a degree of hanging about, but I chatted to other people there as we sat on the grass enjoying the sunshine. Eventually we were told we could go home, and the directors asked if I would be free for another couple of days to come back the following 2 evenings for a night shoot. The next evening I went back to the location (after a day doing my normal job in the office). This time I had to dance around the campfire whilst the festivities continued. The filming went on until one o`clock in the morning, so I was pretty tired when I finally got back home to bed. Despite being hot July, it was quite cold at night, and I wore my pyjama trousers under my hippy skirt for the night shoots. We spent a lot of time on a double decker bus that was serving as the canteen then, plenty of hot drinks and food were laid on for us. The following evening was pretty much the same, more dancing around the fire, and eating and drinking. I came away with such a great feeling that I’d finally achieved a ligfe-long ambition and I had honestly loved every single minute of the whole experience. I watched myself in both episodes and have the DVDs and photos I took on both days as brilliant memories. I have been lucky enough to appear in another couple of programmes too, but haven’t really done any more extra work since 2004, when I started working full time as a tourism advisor for Wycombe District Council and wasn’t able to commit to filming in the same way as when I was only working 4 days a week. In the 10 years since I have gained my own family and my time is filled with working part time, and caring for my 2 year old son. But going back to do extra work is something that I want to do again, and one of these days when I have some time, I will re-join with some agencies in the hope of adding to my film credits.